How did Indigenous Australians contribute to the Defence of Australia in World War 2? The Battle of the Coral Sea – did it save Australia? It is February 1942. A Japanese attack on Australia is expected. Can you prepare Darwin’s defences and protect Australia from this attack? Please note that this interactive requires Flash. Watch the video and read more about this on the Australian History Mysteries website - www.AustralianHistoryMysteries.info. My father, Stanley Edward Luck VX 21737 / 3520 fought in World War 11. He was a gunner with the 2 / 14 Field Artillery when he arrived in Darwin in July 1941, courtesy of an army transport truck stopping only for two pots of beer at the Tennant Creek pub to celebrate his 21st birthday. He was present during the bombing of Darwin on 19 February 1942 and on subsequent days. He was guarding Parap Airfield when the first bombs hit shortly after 10am. He was later to fight against the japanese on the Kokoda Track. I dedicate this song to him and all the others, both service and civilian, who were there in Darwin on 19 February 1942. This is their story. Lest we forget. © Gary Luck, February 2012. The writer weaves historical facts into story lines with real time action sequences. Where the story varies from historic opinion, forensic reasons are revealed for differing views, and the reader’s judgement is invited. Examples are the role of spies, withholding the air raid warning, attached hospitals, interpretation of information and subtleties of the Japanese attach plan. Further information call John on 0417 367 610. 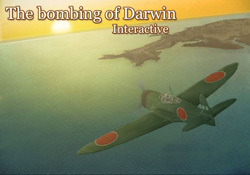 Remembering those desperate days when the Japanese dropped 683 bombs on Darwin in the first ever attack on Australia by enemy force and the 62 other raids over the next 18 months. 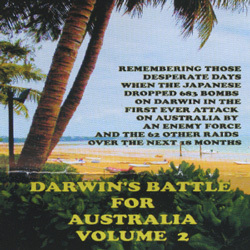 To learn more about the most desperate days from veterans who where there at the time, get a copy of theDarwin's Battle For Australia Volume 2. There are 368 A4 pages of text and photos on 90gsm high gloss paper, plus a free DVD with a PDF copy of the book and another 2,700 plus JPEG images of photos sent in by Darwin Defenders’ members.